On the MyGlass website, tap or click the Add a Contact card. Tap or click the Create New Contact link. 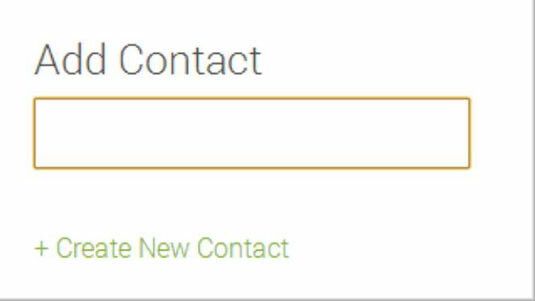 The New Contact page appears as a new tab in your web browser. If you’re using the MyGlass app on your Android smartphone, your default contact management app appears on your smartphone’s screen. 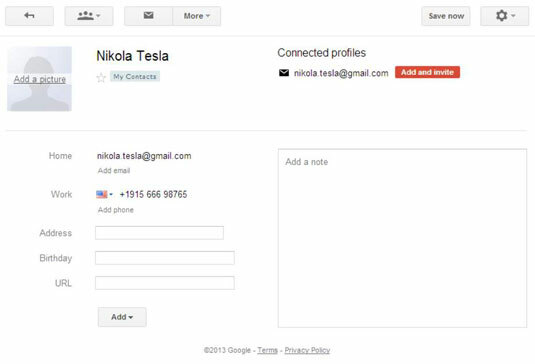 Add contact information, including the contact’s name, photo (if any), e-mail address, phone number, and birthday. Tap or click the Save Now button in the top-right corner. Tap or click the MyGlass tab in your browser, or switch to the MyGlass app on your smartphone. On your Glass, import the contact. If you don’t see your new contact, refresh the browser window by pressing F5 on your computer keyboard; on your smartphone, tap Refresh on the menu.